What’s on the Friend Web Site? Emily, Brennan, and Anna R.
A quilt is a blanket made of layers of fabric stitched or tied together. Sometimes quilt squares are made and named for special events. Quilts become a way to tell a story. 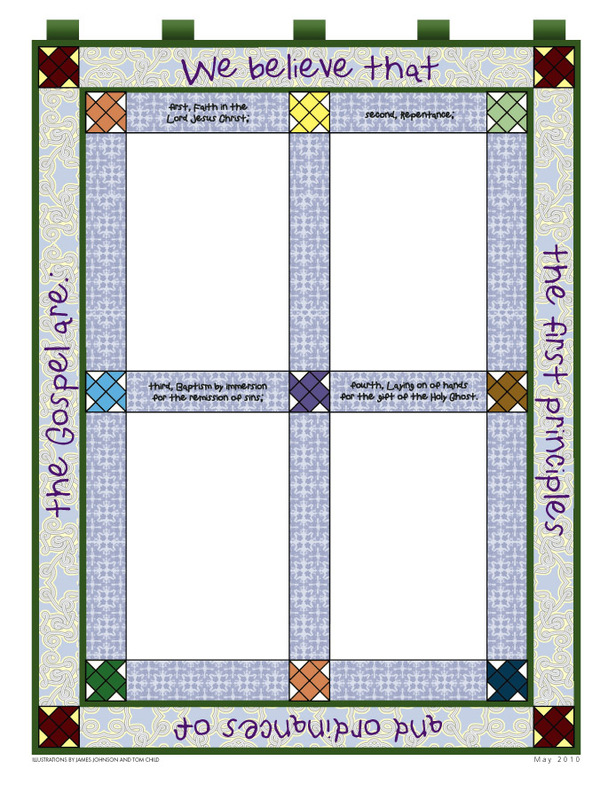 Like a quilt, the gospel has basic pieces or parts. We learn four of the most important parts in the fourth article of faith. The quilt on the opposite page has the fourth article of faith written on it. Each part of the article of faith is in one of the four big squares. The first part is faith in Jesus Christ. This means we believe in Jesus Christ. He knows and loves us, and wants to bless us. We show our faith in Jesus by following Him. Repentance is the second part. When we don’t do the things Jesus taught, we repent and try again to do what He wants us to do. Baptism is the third part. When we are baptized we make a covenant with Heavenly Father. Every time we take the sacrament we renew our covenant. A covenant is a sacred promise. We make promises to God and He makes promises to us. God always keeps His promises to us, and we should always try our best to keep our promises to Him. The gift of the Holy Ghost is the fourth part. It is given to us to help us keep our covenant. The Holy Ghost helps us to do what is right and leads us to obey the commandments and live the gospel so we can become more like Jesus. The fourth article of faith teaches us the first principles and ordinances of the gospel. We live the gospel now to prepare to live with Heavenly Father and Jesus someday. Read the fourth article of faith in the Pearl of Great Price. Pray to ask Heavenly Father to help you know how you can do the things taught in the fourth article of faith. Memorize this article of faith. Cut out the quilt on page 41. In the empty squares draw your own quilt squares to represent faith in Jesus Christ, repentance, baptism, and the laying on of hands for the gift of the Holy Ghost. Help someone else memorize the fourth article of faith. Keep your promises like Heavenly Father keeps His promises to you. Go to a baptism of a friend or a new convert to the Church. During the sacrament think of how Jesus loves you and made it possible for you to repent, be forgiven, and return to live with Him and Heavenly Father again. How does what you have done help you understand the fourth article of faith?